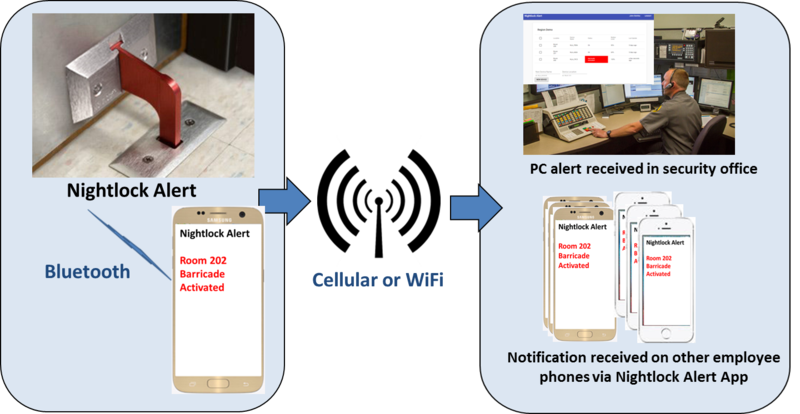 The Nightlock® Alert system provides protection and notification for emergency lockdown situations to prevent an act of terrorism, such as an active shooter. The room occupant simply drops the locking handle into the floorplate and Nightlock Alert automatically notifies the security office and all user smartphones regarding the lockdown emergency. When a user opens the wall box to access the barricade handle, the Nightlock Alert module detects the emergency, connects to any user smartphone (Android or iPhone) within range and automatically sends the emergency notification to all department users and to the security office computer. The emergency notification indicates which specific room(s) has activated the door barricade. Nightlock Alert not only protects the occupants of the room that is in lockdown but the notification instantly alerts the rest of the personnel within the building(s) to take appropriate action.